Thinking about bring your pet on your next trip? Learn the best ways to prepare, what to bring, and the common mistakes to avoid in our helpful guide. Whether you're driving, flying, or sailing to your destination, taking your pet along can add to your stress. We cover everything you need to know—and do—to make your travel as easy and safe as possible. Think of your pet as a passenger, not cargo, when making plans. You may need to make special arrangements for them, including paying fees for their travel. Pet policies and restrictions vary by airline, so you'll need to do some research BEFORE booking a flight. Flying with your pet will also cost you, unless you have a Service Dog and Emotional Support Animal (more on that below). Prices for transporting pets range from $75-200 each way. Tip: Consult IATA to see if your pet carrier is approved for airline travel. And remember, guidelines differ for under-the-seat or checked cargo carriers. In the past, only dogs and cats were allowed on flights. But some airlines have loosened their restrictions to include pets like rabbits, hamsters and gerbils and domesticated birds. In-Cabin: Smaller animals, usually under 20 pounds, can travel under your seat as carry-on luggage. They must be housed in a well-ventilated, airline-compliant carrier and cannot be removed during the flight. Note: You will still be charged the pet fee if transporting a pet this way. 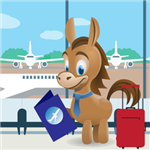 Checked Cargo: Larger animals, usually dogs and cats, can travel as checked luggage in the cargo hold. Airlines do limit pets traveling as cargo in summer and winter months AND some climates. Note: Snub-nosed or brachycephalic breeds like bulldogs, Boston terriers, boxers and pugs may be forbidden from flights due to breathing problems. Since these animals aren't strictly pets, airlines don't charge fees for transporting them. They don't need to travel in crates. But service dogs and emotional support animals are NOT the same thing. Service Dogs: These animals are specially trained to perform specific functions for their owners, according to the Americans with Disabilities Act (ADA). Seeing-eye or medical alert dogs are examples of service dogs. Emotional Support Animals: These types of companions provide comfort to people with emotional or mental challenges like depression, anxiety or post-traumatic stress. They are not trained to provide specific functions like service dogs. Emotional support animals are not always dogs. In fact, the loosely-defined parameters of what qualifies as one has led to some eye-opening examples in recent years, including ducks, squirrels and even a peacock. This has led to safety concerns. Many airlines are now tightening restrictions for emotional support animals on flights. Tip: Don't try to pass off your family pet as a service animal to save the pet fee when flying. An untrained animal, even a usually docile one, can react unexpectedly to the stress of flying. You may be responsible—and financially liable—if your pet acts up on a flight. And the cost will likely be much higher than that roundtrip pet fee. Buy a direct flight: By avoiding layovers, you'll decrease the chances of anything going wrong while your pet is moving from plane to plane. A direct flight also cuts travel time in half, which allows you and your pet to reach your destination sooner. Pick flight times based on seasons: Early morning or late evening flights are better when the weather is warm. Afternoon flights are better suited for cold weather. Worried about transporting your pet? : Rely on professionals to help. The International Pet and Animal Transport Association (IPATA) is a nonprofit group whose mission is "the safe and humane transport of pets and other animals." Visit their site for valuable tips and resources, as well as companies that will transport your pet for you. Much like with airlines, policies for traveling with your pet vary with other forms of transportation. Many trains and metro lines will allow you to bring small pets (under 20 pounds) with you in a compliant carrier. Amtrak charges $25 for routes 7 hours or shorter. Some trains even have coach cars dedicated to pets and pet owners. You'll have a harder time on long-distance buses, as providers like Greyhound only allow service animals. In either case, it's best to research pet regulations before buying a tickets for you and your pet. Car travel can be the easiest way to travel with your pet, though some animals still get anxious. Make sure to keep your pet stowed in a crate or carrier that is secured by a seatbelt. Take plenty of breaks to allow your pet a chance to eat, drink and stretch its legs. For shorter journeys, your pet may not need a crate. It's probably still wise to secure them with a seatbelt or harness of some kind. If you're renting a car, make sure to inform the agency that you'll be traveling with your pet. You may face a higher security deposit or mandatory insurance in some cases. Tip: Resist the urge to let your pet outside its crate when you're driving long distances. Pets get antsy, just like people. Yours may decide it's play time when you should be focused on the road. Even a momentary distraction can have dire consequences for you and your pet. Most importantly, NEVER leave your animal alone in the car on a warm day. Even if the temperature hovers around 75 degrees outside, your car temperature can rise to 120 degrees or even higher. Only the Cunard cruise line allows dogs and cats onboard, specifically on the Queen Mary 2. But your pet will be taken care of by cruise members, not you. Otherwise, your only option for travel by ship is a personal boat. Buy a life jacket: Find a life jacket for your pet and make sure it fits properly. Develop an emergency plan: Have a strategy in case your pet goes overboard. Let as many people on the boat know about the plan, and ensure it is appropriate with the crew. The best approach is to cut the engine of the boat and to call for them. Bring a first-aid kit for boating: Make sure to bring a first-aid kit suited specifically for boats and ships. This should include antibiotic ointment in case your pet gets any minor cuts or scrapes. Check boating laws by country and state: Laws involving animals on boats vary by state (and country). Make sure to check local laws before boating with a pet. No matter how you're getting to your destination, you'll also need to account for transport when you arrive. If you plan to use a rideshare like Uber or Lyft, cabs, or buses from the airport or train station, make sure to research beforehand to learn any rules or restrictions. The last thing you want after a long day of travel is a last-minute hassle getting to your hotel or apartment. Tip: Research local laws. Foreign countries have different rules regarding pet travel. Some may require specific paperwork or even enforce a quarantine period. You can find more information here. Transporting your pet is only the first step when it comes to travel. Keep reading for tips to find the best accommodations for you and your furry friend. Just like when traveling with a human companion, you've got plenty of options where you and your pet will bed down when traveling. Hotel policies vary when it comes to animals, but some chains pride themselves on being especially "pet-friendly." Most, but not all, draw the line at dogs and cats, however. Even at these chains, policies (and even what types of allowed pets) may vary from property to property. Some places, like certain Four Seasons Hotels, even have pet-related amenities like water bowls and doggie (or kitty) beds. If your hotel does allow for your pet, you'll likely still face a nightly charge of $20 or more and possibly a deposit to insure against damage. Tip: When in doubt, call and ask. Many hotels accepting pets will say so in their online listings when you search with sites like Kayak or Expedia. You can sometimes even search using that criteria. If you can't find an answer either way, call or email to double-check. As always, investigate a hotel's pet policy BEFORE you book. And when you do reserve a room, tell the property beforehand to avoid unexpected difficulties or fees. 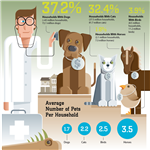 Individual owners decide if they want pets at their properties. You should be able to find that information in the listing. If not, message them to find out. Some owners may be flexible, so it can't hurt to check. Resist the urge to mislead about your pet's habits when booking a place. If your dog is a frequent barker, don't describe it as "quiet." Remember, you'll be rated as a guest when you leave. A bad experience can handicap your odds of getting accepted for future bookings. Just like hotels, you should be able to find low-budget hostels open to allowing pets. You can search online or call to find a suitable one for you and your pet. But expect to pay a little extra for the privilege. It may sound obvious, but ALWAYS check to make sure your pet is welcome when staying with friends. Your loved ones may have a good reason to reject the idea, including allergies or an antisocial pet of their own. No matter where you'll be staying, you have to make sure your pet is welcome to join you. Scrambling to make last minute changes won't just inconvenience you—it'll also add more strain to your pet, who will already be stressed from travel. Now that your travel arrangement are set, you can turn your attention back to your pet. Read on for important steps to acclimate them before you leave. You'll need to schedule a veterinarian appointment about a month before your travel date. Airlines (and many destinations) will require specific paperwork, including a health check with current bloodwork, an updated vaccination record and sometimes even a microchip implant. Your vet can make sure your pet is healthy enough to travel. You can also inquire about sedatives if your pet is prone to anxiety. However, we don't recommend drugging your animal. Instead, try other ways of acclimating your pet. If possible, get all the required paperwork BEFORE you leave the vet's office to avoid delays in receiving it by mail. This paperwork is required if you plan to travel with your pet—you won't be able to board a plane or get through security without it. Buy an approved crate/carrier: You'll want to do this at least two weeks in advance (we'll explain why below). Get a crate or carrier suitable for your pet's size as well as for the mode of transport. The best way to check if your crate/carrier is appropriate for your trip is by consulting IATA and purchasing an IATA-approved carrier. Make sure your pet's tags are current: Ensure your pet has external tags on its collar and check that all the contact information is accurate and current. It's also smart to inspect your dog's collar for signs of aging or fraying—you don't want it to come off during the trip. Photograph your pet: Carry a current photograph of your pet in the extremely unlikely event that your pet is lost during transit. This will make it easier for transit staff to conduct a search for your animal. FYI: Despite a rash of recent headlines about pet fatalities on airlines, the vast majority of pets travel safely and without incident. Rather than lose sleep over the unlikely event that something may go wrong, take the appropriate steps for your pet's upcoming journey. Research suggests that your animals can sense your anxiety, which may compound their own. The more comfortable your pet is with their travel crate, the easier your trip will be. Start acclimating them a couple weeks before you travel. Leave the crate open in a common room. Add a favorite blanket, pillow or one of your shirts (or shoes). Place a few of your pet's toys inside. You DON'T want to pressure your pet to enter the crate, which is why introducing it early is so important. Animals are inquisitive by nature. They're bound to explore an unfamiliar object in their environment before long. Tip: Try casually slipping a treat inside the crate. But make sure not to call attention to it. Your pet's nose will direct it before too long. Now is also a good time to properly label the crate. Add your name, permanent address, phone number, and final destination in clear, legible writing. This is especially important if your pet will be traveling separately (for example, as cargo on an airplane). Again, these are precautionary steps you'll likely never actually need. But it's also best to be prepared. You've covered all your bases—now it's time to hit the road. We've got some tips to make your travel day as stress-free as possible below. Animals, like children, are creatures of habit. Travel is bound to throw off their schedule, but try to create as much consistency as you can. Here are some easy-to-follow steps. Tip: Consider a "dry-run" with your pet. If you have the time, try rehearsing your trip the weekend before. This can include a short car ride or even walking them around the airport or train terminal. Such practice may help get them acquainted with the new environment. It'll certainly make you less nervous on the big day. Feed your pet as usual: Now is NOT the time to introduce new food or treats. Until you leave for your destination, try to keep your pet within its normal routine. Add in a little extra exercise: Whether it be a longer than usual walk or some vigorous playtime, try to help your pet work off some of their excitement or nerves before you leave. Prepare the crate: By now, your pet should feel as comfortable in their crate as in their favorite napping spot. Make sure it has the same toys, blankets and comfort items you used to acclimate them. If they're traveling separately from you, make certain they have sufficient food and water. Use a treat or gentle command to get them in crate so you can leave. Tip: Freeze a small bowl of water for your pet's crate. The water will melt as your pet needs it and won't make as big of a mess in the crate, especially as your pet boards the plane. Stay calm through check-in and security: As we've already discussed, your pet may take its cues from you. Follow directions from security personnel but don't be afraid to talk to them. They want the same thing you do—a safe, easy passage for your pet. Keep them in their crate: If your pet is traveling with you, resist the urge to remove them from their crate during the journey. The new environment can cause added stress. Or they'll love it so much you won't be able to get them back in the crate. Make time for a bathroom break: After a long (or even short) trip, your pet may need to relieve itself. Find an appropriate place to let them do their business. Put out food and water for them: Traveling, especially air travel, is extremely dehydrating. Give your pet water and a snack as soon as you arrive at your destination. Give them some love: New experiences can be terrifying for a pet. Your destination is likely full of new sounds and smells that can confuse or over-stimulate your pet. Take time to pet and play with them before completing your journey. TIP: Travel can discomfort even the friendliest pet (or person) in the world. Avoid introducing new people, especially children, to your pet right off a plane. Their reactions may be unpredictable and out-of-character. Travel can be hard on everyone, especially your pets. Make the journey smoother by preparing well in advance. Follow our step-by-step guide to avoid becoming overwhelmed. And remember, as with most matters, communication is key. When traveling with cargo as precious as your pet, it's always better to be overprepared than surprised by something going wrong. Leave a comment about How to Travel with Pets?